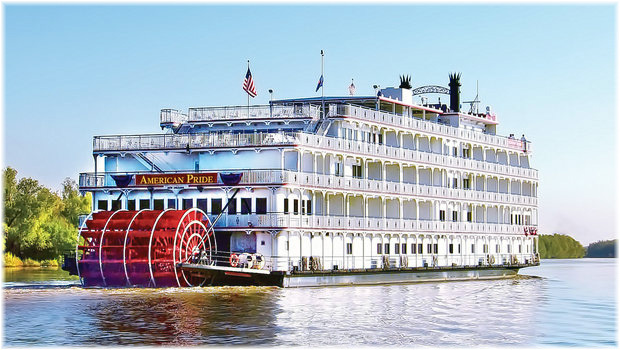 This week we cover three new riverboats on the Mississippi, American Cruise Lines’ 195-berth America, French America Line’s 150-berth Louisiane and American Queen Steamboat Company’s 166-berth American Duchess, announced last week. Also announced last week were Explorer names for Ponant’s four 184-berth newbuildings: Le Bougainville, Le Champlain, Le Kerguelen and Le Lapérouse. Finally, earlier this month, Fathom announced two more Miami departures for Cuba with its 710-berth Adonia. 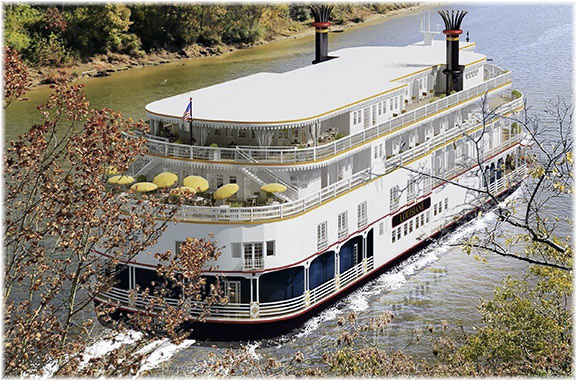 The year 2012 saw a revival of cruising on the Mississippi River and its tributaries when, what is now the American Queen Steamboat Company, managed to place the 436-berth 3,707-ton American Queen back into service for the first time in four years. The American Queen had been built by McDermott Shipyard in Morgan City, Louisiana, in 1995 and been laid up since 2008. That same summer, American Cruise Lines introduced its own newbuilding, the 150-berth 2,700-ton American Eagle, completed that year in the line’s own shipyard, the Chesapeake Shipbuilding Company, in Salisbury, Maryland. After four seasons of no Mississippi cruises whatsoever, the river was back to two ships and 586 berths. Then, in 2015, a third vessel was added when ACL built the 150-berth 2,700-ton Queen of the Mississippi. This brought the number of berths available to 736. Now, come three more vessels with another 501 berths that will bring the Mississippi fleet up to half a dozen ships and 1,237 berths, more than doubling the capacity of the first two ships. First of the new trio is ACL’s 185-berth America, an enlarged version of the American Eagle and Queen of the Mississippi, also from Chesapeake Shipbuilding. She was delivered in May and is now working together with a second Queen of the Mississippi, the first having been sent to the Columbia River as American Pride. Like all the other ACL riverboats, the America is propelled by diesel engines and propulsion is through a stern paddle. Second of the newcomers is French America Line’s 150-berth 4,332-ton Louisiane. Completed in 2000 as the last river cruiser to be build by the old Delta Queen Steamboat Company, the Louisiane was built by Leevac Shipyards of Jenning, Louisiana, and completed by Cascade General Shipyards in Portland, Oregon, for work on the Columbia River. Unlike most other riverboats in the United States, the Louisiane is screw-propelled, with propulsion obtained from four diesel engines. This summer, French America Line brought the Louisiane around from Portland to New Orleans as deck cargo on a heavy lift sem-submersible barge and she is now at the Bollinger Shipyards in New Orleans (See video), where she is being prepared for her inaugural voyage from New Orleans on October 22. The Louisiane will sail from her own dedicated cruise terminal at Gretna, Louisiana, directly across the river from New Orleans. The third “new” Mississippi cruise vessel, announced last week, will be a 166-berth 3,560-ton conversion to be renamed American Duchess. 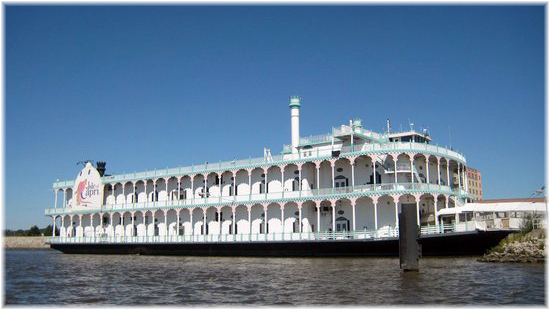 This vessel has been selected from among the American floating casino fleet to become the American Queen Steamboat Company’s third ship, joining the American Queen and the 223-berth American Empress, which operates on the Columbia River. The floating Isle of Capri casino at Bettendorf, Iowa, has just been replaced by a new shore-based one, making the vessel available for purchase. 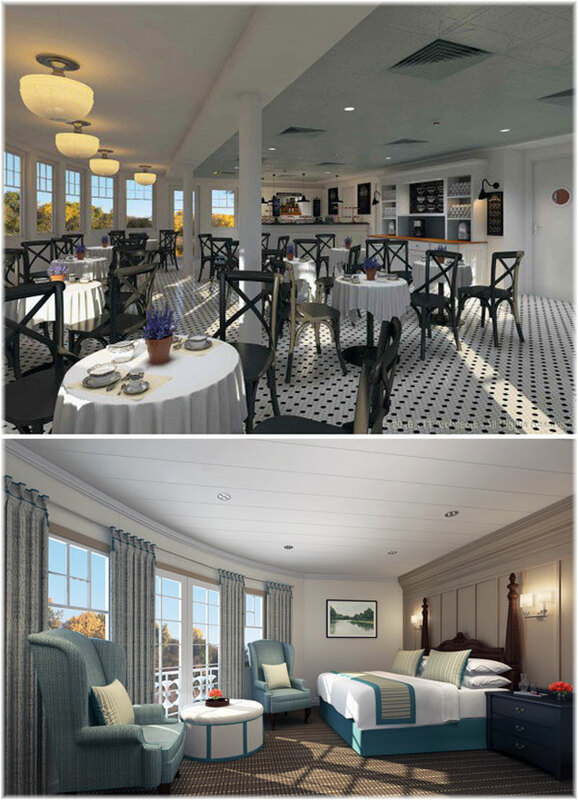 Presently called the Bettendorf Capri, the vessel is has two 10’9″ tall decks, while a third lower height deck will be added atop the ship. A paddle wheel will also be added to give the impression that the vessel is powered by her own paddlewheel, although this will not actually be the case and she will be screw-propelled. 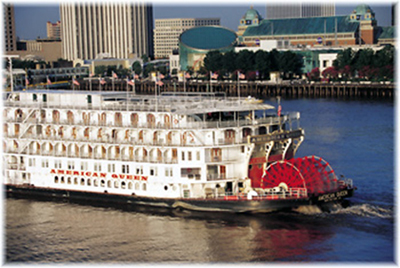 The latest American Queen vessel was built in 1995 by the Bender Shipbuilding & Repair Company of Mobile, Alabama. Bender, which is no longer in existence, produced a fleet of eight casino ships between 1993 and 1995 and then never built any more. To date, American Queen has not announced what shipyard will get the conversion contract nor its cost, but it has set a deadline for delivery by June 2017. 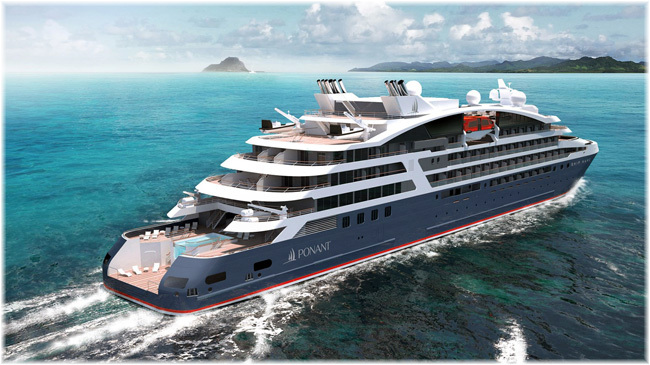 Ponant last week unveiled the names of its four newest expedition ships. To be called the 184-berth Ponant “Explorer” class, the 430-foot ships will be equipped with the latest technology and will hold an Ice Class 1C classification. The first two ships will be delivered in the summer of 2018 and the next two in the summer of 2019. The chosen names of Le Lapérouse, Le Champlain, Le Bougainville and Le Kerguelen will pay tribute to four great French explorers who set sail to discover new continents and reflect Ponant’s loyalty to the France as the only cruise line operating under French flag. Ponant was founded in 1988 by Jean-Emmanuel Sauvée and a dozen French merchant navy officers. It already operates four nearly identical 264-berth ships, Le Boreal, L’Austral, Le Lyrial, and Le Soleal, as well as Le Ponant, the company’s original 64-passenger sailing vessel. In October 2015, Ponant was acquired by Artemis S.A., which is owned by the Pinault family, who also own Christie’s auction house and Chateau Latour wines. Artemis has focused on strengthening the Ponant brand by concentrating on the luxury expedition market. After experiencing strong demand for Cuba, Fathom, the new social impact line launched by Carnival Corp & plc earlier this year, is cancelling two of its autumn Dominican Republic cruises in order to make two more cruises to Cuba. The 7-night cruises on Fathom’s 710-berth Adonia will sail round trip from Miami to Havana, Cienfuegos and Santiago de Cuba on October 9 and November 6. 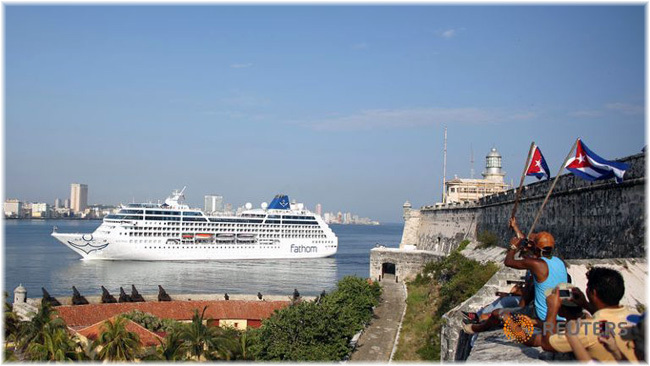 Passengers on the Cuba sailings must fulfill the US people to people requirements for travel to Cuba through programs and cultural shore excursions. Demand for Cuba sailings will make up for a serious weakness in the take-up for the line’s social impact sailings to Puerto Plata, where Carnival have opened a new cruise terminal called Amber Cove. As this is the ship’s only port on Dominican Republic cruises it is no wonder demand is not high. 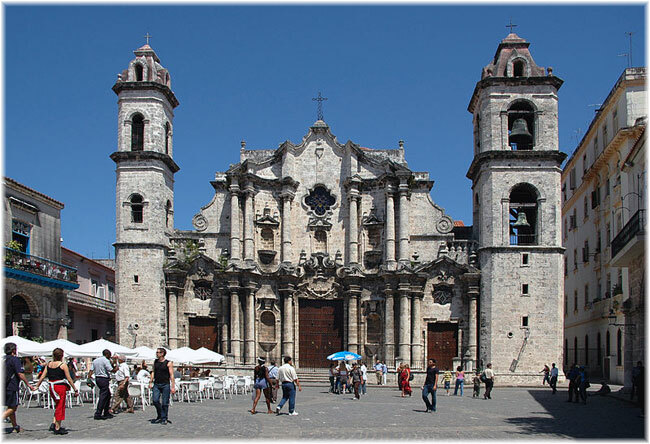 Passengers booked on Dominican Republic sailings can choose between remaining on the same sailing and going to Cuba at no extra cost – there is a substantial fare difference between Fathom’s Dominican Republic and Cuba sailings – and the line will pick up the cost of Cuban visas. 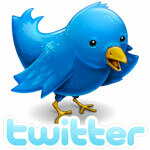 Or, they can reschedule on another Dominican Republic sailing at the same fare or receive a full refund. Fathom is the only US-based cruise line presently sailing from Miami to Cuba. Americans can also now sail on the Celestyal Crystal’s Cuba cruise but departures are from Montego Bay. Other cruise lines that have permission to sail to Cuba include Ponant, which will offer voyages from Miami in 2017. Additional sailings are being offered from Havana by Star Clippers and on Variety Cruises’ Panorama II. Several other US cruise lines are selling cruises to Cuba, although they do not yet have the final permits. These include US-based small ship cruise lines Grand Circle, Pearl Seas and Victory Cruises, and deep sea operator Viking. The lines expect to have permits before the cruises take place, although Pearl Seas had to cancel a number of sailings this year because permits did not arrive in time.